What we have here are four sets of one modern piece sandwiched between two works by major Baroque composers, and the timing works out proportionally to about twice as much old as recent music. Greilsammer, Israeli born and Juilliard trained, articulates an "almost irrational…longing to see opposing worlds meet and converse with one another in the infinite hope of witnessing the birth of a dialogue between the extremes." Does this work? If this is a matter of contrast and comparison, there is more contrast than similarity, certainly. In the first set, the Feldman is an extremely quiet and low key piece, characterized by silence, in fact, more than almost any piece one could name. The Rameau begins with a slower pace than one might expect for a Gavotte, but the variations tend to be livelier. The Soler, as played, resembles a Scarlatti sonata. In the final set, the modern piece, translated as "Cradle Music," the beginning, especially, features a loud and violent attack, unsuitable for a lullaby, and that is not the only such, belying the title, though it does yield to some quiet music also. The opening Frescobaldi Toccata is quiet and gentle, especially for a toccata, and the ending Sweelink is rather cheerful and gentle, in spite of an unpromising title, which promises an end to a young life. The third set is perhaps the most interesting and appealing in some ways. 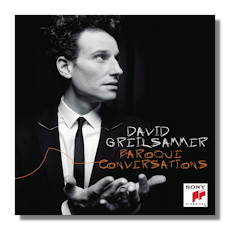 In the Froberger, Greilsammer somehow manages to make his piano sound remarkably like a harpsichord. The Sahar makes use of a prepared piano, similar to the one Cage used in his Sonatas and Interludes for Prepared Piano, and includes a very long trill. The Gibbons is very nicely played and also subtly suggests a harpsichord. Set 2 contains the longest modern piece, "Wham," at nearly eight minutes. The title is taken from a Roy Lichtenstein painting of an airplane being exploded by another, reproduced in the jewel case. The pianist acknowledges that "like the painting, the music is also violent, comic, harsh, tragic, immediate and in constant motion." Not pleasant music. Written for the performer, as was the Sahar, it may, as he suggests, reflect the fact of "having grown up in a strange and troubled part of the world." The sandwiching pieces are nice, with the Handel being the only multi-movement piece. We can acknowledge that Greilsammer may have achieved what he set out to do, although the outcome of these "conversations" is going to be a matter of individual perception and opinion, I think. But the conversations are interesting at least.